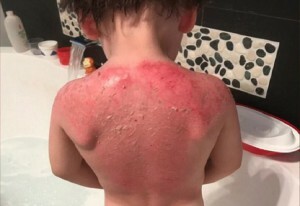 Concerned parents take to social media to warn others about popular sunscreens that have resulted in severe reactions. The latest warning comes from a Queensland mother who claims her family’s holiday turned into a nightmare after her children broke out in blisters using a popular sunscreen. Vanessa Munroe, from Broadmere, took her two children, aged six and 11, on a camping trip from Friday to Sunday and purchased Banana Boat’s SPF50+ Sun Comfort clear spray to keep them protected. She said just one minute after spraying her daughter with the product and rubbing it in, Ruby started to blister on her lips, chin and under her eyes. “She was up all night and the blisters were so big they’d pop themselves,” Ms Munroe told Yahoo7. 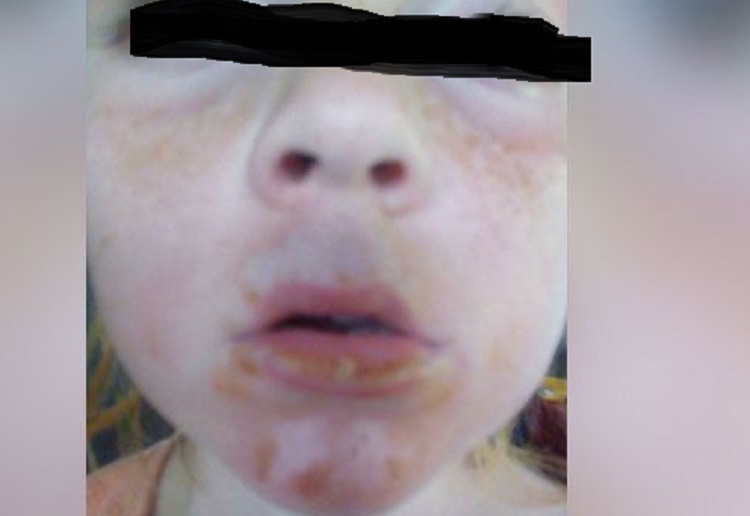 Ms Munroe said she took Ruby to a chemist on Sunday, who said it appeared she had suffered a chemical burn. Last year CHOICE said that a potential class action against the maker of Banana Boat Australia, Edgewell Personal Care is brewing after lab tests found seven of their products failed to meet their stated SPF claims. Some SPF 50+ aerosol sunscreens were showing results as low as SPF 11. Read more HERE. In October we shared that three-year-old Rivers, suffered severe burns while wearing Peppa Pig sunscreen on family trip to Bali. Rivers Jasper suffered burns to his back, face, shoulders and ears during a family trip to Bali last week. His parents Shannae and Paul Jasper said the harrowing experience has left their son terrified of having any kind of lotion or spray put on. ‘He’s absolutely petrified now of when we try and put any type of spray, lotion, even in the bath he won’t pour the water over his back,’ Ms Jasper told Seven News Perth. Ms Jasper said they put the Cancer Council-approved sunscreen on three-year-old Rivers in their hotel room but he was in unbearable pain within minutes. Early in the year we shared the story of mum, Jessie Swan, who said her three-month-old son was in hospital for three days after a reaction to the 50+ Peppa Pig sunscreen range. She posted to the Cancer Council Facebook page to warn others, “This is my 3 month old son. He has not been in the sun, he was simply outdoors so I put screen on him just in case. We’ve been in hospital for 3 days 2 nights so far trying to treat this horrible rash/burn caused by your 50+Peppa pig sunscreen. DO NOT BUY THIS SUNSCREEN. Ms Swan certainly isn’t alone, a Sydney mum also shared how she suffered first and second degree burns after using the same product. Mother-of-two, Kim Cancellier, said she bought the Peppa Pig Cancer Council sunscreen and decided to test it on herself before putting it on her three and five-year-old daughters. “Instead of acting as a sunscreen and protecting me from the suns rays it had an opposite effect and turned me BRIGHT red, completely and utterly burnt,” Ms Cancellier said in her Facebook post. The 31-year-old said she was disgusted the sunscreen failed to protect her in the two hours she was in the sun at Dee Why beach last month. “This was a product I purchased with my young daughters in mind. A product I thought would PROTECT my children. How could I not be aware that this is the result of using a cancer council branded sunscreen?! I urge any of you with kids to NOT use this product without patch testing first! The Cancer Council of Australia did reach out to both mothers and issued a statement on its Facebook page. “We would like to reassure everyone that our Cancer Council Kids sunscreen has been formulated to be as suitable for delicate skin as possible,” a spokesperson said. It is alarming this type of reaction to an Australian endorsed product that is a trusted brand, and I do feel for anyone with this reaction! However as the 31 year old mother said she tested it on herself ! To me it is like all other products that we use patch testing is best testing! It could also be there was a formula issue in the bottles unless someone pays for testing then they will never know! But it is interesting! I know with my little one when he was a bub I stayed away from outside till I knew he could handle the elements, sunscreen to me is so iffy like any skin care on such delicate skin at such a young age anything can happen and expect the unexpected! so my theory was just avoid it! At least till the 8 to 12 month mark the crawling stage when bub is coming into contact with all types of things! But I do feel for the that poor mother she was only trying to add protection to her little one! I think a recall should be considered if this many people are reacting or it needs to be made public media knowledge ie the news! There would be people just assuming the screen had worn off or they had not applied correctly or they were in the sun to long! I refuse to buy sunscreen for myself because I am horribly allergic to every brand I have tried. Hubby buys his own and the grandchildren bring their own. This is a horrible reaction for those pictured. I never bought that brand of sunscreen. Really concerning!! Always do a skin test if you can – we skin tested Banana boat & it turns out my daughter was allergic to it but she is ok with the Cancer Council Peppa pig one so I have stuck with that one. how scary! Sunscreen is expensive so I know we can’t afford to do the spot testing to check for a reaction first it is just crazy! Oh god, I bought a bottle of that YESTERDAY!